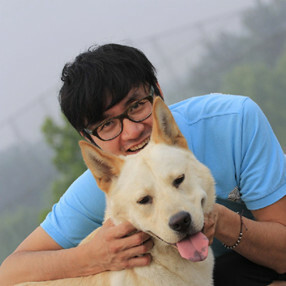 Denny Chen ‘The Cool Hipster’ of the Natooke team, he is energetic, motivated and always wears a smile on his face! If you want to learn to beat box or pop and lock Denny Chen is your go to guy! And he can even repair your bike for you! 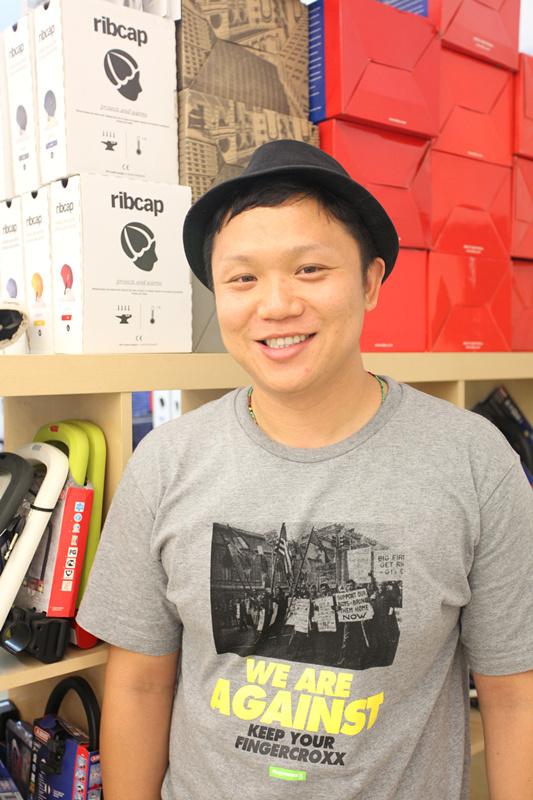 Denny Chen works the Sales and Events at Natooke. 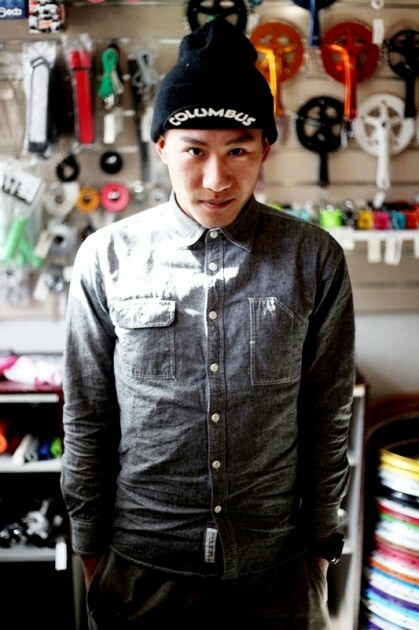 He previously organised a fun event called the Mini Fixed Gear revolution in 2012. Denny Chen can also be known as the Gangnam style extraordinaire, and is the official Natooke dance instructor. 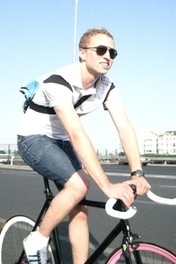 And of course he rides a fixed gear bicycle! Xiao Bu is a funny guy. He had lead many years’ army life before he came to Natooke. And his army life cured him of his weakness. Sometimes he is quiet and simple. Sometimes he is tricky and cunning. He worked in Shimano for a few yeears thus he knows a lot about bicycles. 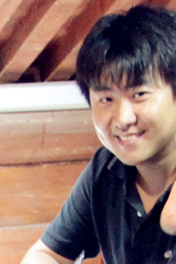 He was in charge of Natooke online shops including Taobao and Jingdong. In addition, he still would like to be a professional saler. Best wishes to him. 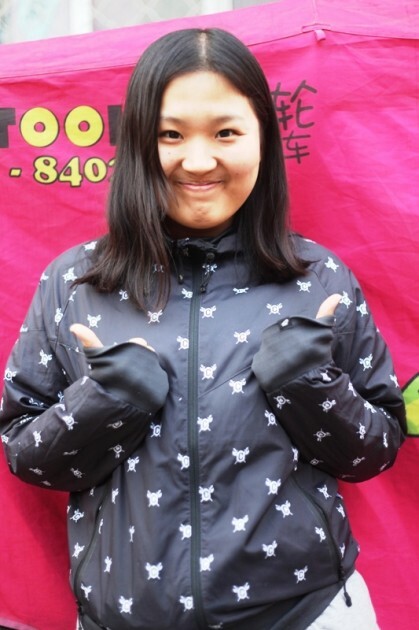 This cute girl is one of Natooke’s Bike Mechanics as well as working the sales side, Yangyang has been building bikes for over 8 months now, and she has mastered this beautiful talent just for you, so she can repair your bike perfectly! This girl may seem shy at first but she is a mystery with many talents from the ability to speak fluent English to being a fierce bike polo contender, which she plays on her much loved fixed gear bicycle! If you like Muscles you’ll like Gala this big strong man is Natooke’s bike mechanic, he has muscles but this guy is all soft and gooey inside! If you need a tool broken Gala is your man! This gentleman often breaks tools by ‘accident’ when building the Natooke bikes, but don’t fret he builds a mean fixed gear bicycle. Gala Rides fixed gear bikes and likes to spend his past time practicing tricks so he can be as good as our Boss Ines Brunn! Having used to working with other large bicycle companies YuanHui fits right at home in Natooke surrounded by bicycles. 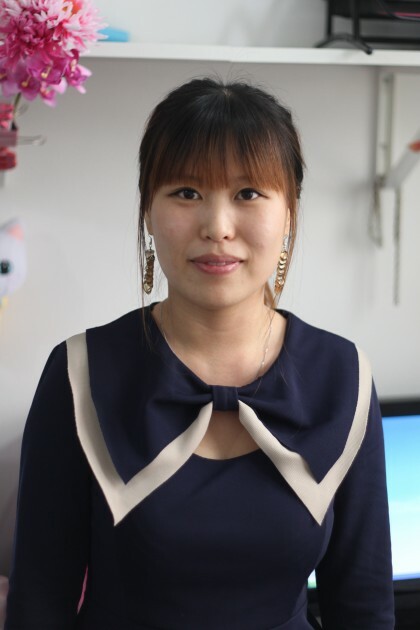 You can find YuanHui in the Natooke shop working helping customers with any needs you may have. Whilst working he is also learning English as a language, maybe some English speaking customers can approach him soon. Him, Denny, Henry and BaoYuan have created their own pact named “Velo Clan” aiming high to be the fastest in Beijing. Affectionately known as SPACEBAR, Kong Ge’s colorful and outgoing personality makes him a perfect person to help you pick out and create a unique new Natooke bike. As a high school student, Kong Ge was known for hanging out at the shop after school and helping out with customers. Now he’s working part time in both the shop and the castle before he starts trade school in the fall. 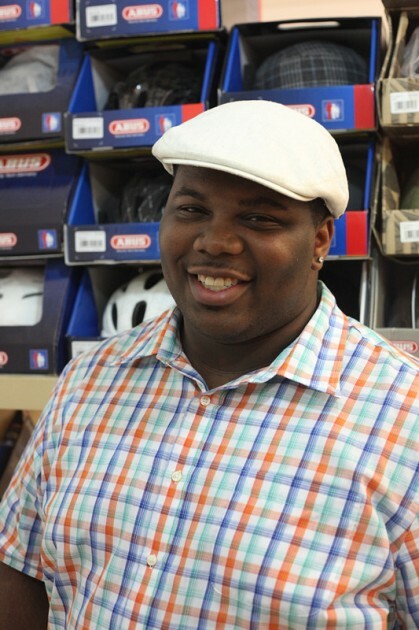 His hilarious and lovable demeanor bodes well with customers, and attention to detail is good when working on bikes. Doudou was the Taobao Manager as well as being Ines’ right hand girl and was the cool, young, funny and down to earth kind of girl! Doudou first emerged after buying a Flying Banana from Natooke, she then became a friend and started working at Natooke and was there since early December 2013. Doudou was addicted to her fixed gear bicycle, but she also a very talented artist and enjoys painting when she wasn’t at Natooke! So this would’ve been the girl to go to if you were in need of a helpful hand when choosing the colours for your new Natooke bicycle, which Doudou would be more than willing to help you with, but be careful this girl loved a chat and would have you talking for hours! This motivated driven chick was the sourcing and inventory manager at Natooke, she was the one that makes sure the product you want was in store when you need it! 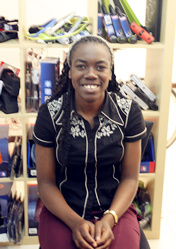 She knew the products inside and out and was the best one to help you when choosing the best parts for your bike. There is never a down moment with Lu Jing her positive attitude was contagious to all those who are around her! Lu Jing was fearless and strong and rode her fixed gear bike almost everywhere she went, even in winter with her 50 minute commute from Natooke to her home! Zi Heng was our go to guy for all our computer problems, this IT manager is young and organized and can fix any problem you had when it came to computers, he keeped us working! Zi Heng studied Computer Science at University, if you liked smart guys this one was for you. He began with the Natooke team after buying a bicycle, he worked part time at Natooke whilst studying but turned into a full time IT man and part time fixed gear bike rider! This fashionista could have given you a tip or two on how to be a modern hardworking women in China. Anna’s relaxed personality and keen fashion sense were only aided by her work ethic and natural brains. Her infectious laughter and friendly demeanor was sure to brighten up your day. In the stressful world of accounting, Anna handled her job with style and grace and keeps the wheels turning here at Natooke. This funny girl loved to shop and talk about the newest trends and styles. As a Beijing native, she was quick to mount her bike and ride through the city in a chic new dress. Zhang Ming was our resident bike genius here at Natooke. As was one of the newest employees, Zhang Ming had six years of experience under his belt from his time at Japanese bike company Shimano. His calm, cool, and collected personality resonated well with customers who may have needed some guidance from an expert when choosing their bikes. At the same time, Zhang Ming had unprecedented knowledge about bicycle mechanics makes him a huge asset in the castle as well. 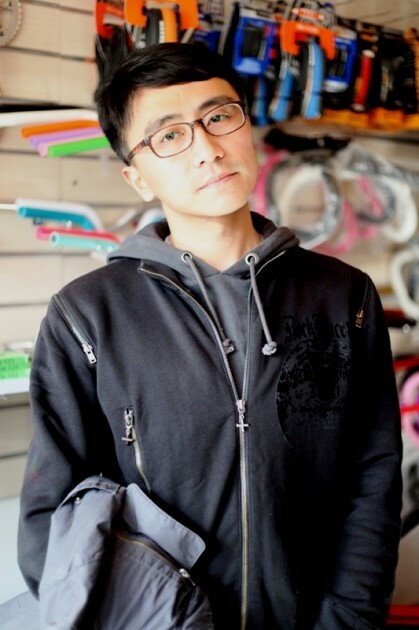 If you had any detailed questions about your bike, or just want to talk about the latest and greatest bike products and parts, Zhang Ming was sure to impress! One this we’ll always remember about Fernando as this man was about his business when it came to his job. This man knew what he is doing when it comes to distribution, and we were extremely lucky to have him as our Distribution Manager! His professional work style helped him to effectively build up Natooke’s distribution network in China and we couldn’t be more grateful. But even with all these smarts he also has a strong personality and is known for being very friendly and nice to all he may come by. Due to Fernando’s hard work, Natooke became an international business and we wish him the best! Mark worked as an English teacher before he came to Natooke. That is why he could speak very good English and his vocabulary is amazing. Whenever we came across difficulties in translation, he was the best guy to come to. He was in charge of the distribution of Respro masks during his 2 months’ stay at Natooke. His hardworking and easygoing character impressed all of us deeply. Besides, he was interested into history especially Chinese history very much partly because his wife is studying history as her major for Master Degree in Renmin University of China. We sincerely hope everything goes well with this gentleman. Christine may seem like your everyday Chinese, but this girl can speak very good English. She was the person editing and translating some of our Natooke Newsletters, event outlines and reports and she also translated parts of our Natooke website! Christine was inspired by Natooke because of our green mission – promoting the idea to find ways how you can reduce your environmental impact, like through cycling. She really loves our Natooke banana logo (us too). Christine is very socially aware and wants to help do things for the greater good of our planet! She is very thoughtful and a generous person that wants to take her time to do the right things for good causes! 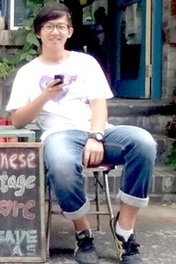 With close to perfect English this young Beijinger used to be known in the shop as the “Man for Everything”. He actually started out doing a 3 month internship in the shop and rose up to be the store manager workig for us at Natooke Beijing for 2 years. He rides a very classic matt black Columbus steel frame with chrome plated lugs and very special components like the Paul cranks. Watch out: Never say his bike looks too normal or even boring! He will know you have no idea about good bikes and try teaching you everything. Dupree has an amazing talent to instantly understand a customer, in terms of what they are thinking and what they need. We wish this thoughtful talented man all the best for his MBA in the USA and look forward to the next big things he is up to! Big Ken was often regarded as a ‘big brother’ here at Natooke for co-workers and customers. 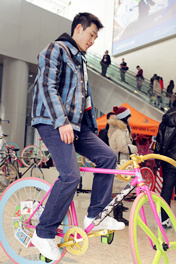 This very young Beijinger had already bought a fixed gear bike before getting to know Natooke. We taught him how to build up bikes and repair bikes. 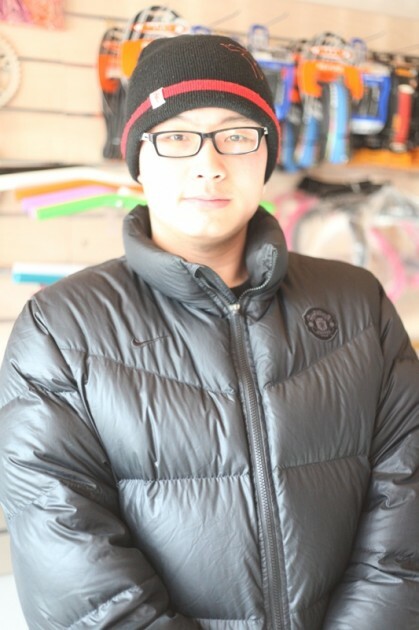 Customers liked this full time Beijing shop bike mechanic as he always helped with any kind of bike issue. Ken enjoys doing some tricks on his bike because he loves playing around, not only with bikes but also with helicopter models, skate boards or cameras. Due to family pressure he is now taking care of computers for CCTV. We are happy he still shows up once in a while to say hi. This young friendly guy is only 19. He moved to Beijing with his father and came to Natooke Beijing to purchase his first fixed gear bike and that’s where it all began. He fell in love with the Natooke shop and hung out at the shop until we finally offered him a job. He took care of online sales for the Natooke company and he is actually very efficient working with Photoshop and he would be our go to guy for anything to do with photos! We hope to continue to see him at rides and events. 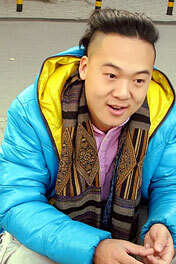 A local Beijinger Liu Jun Wen was always considered a nice guy by the Natooke Beijing clan. He worked for us a cashier and doing all the trips to the bank. Through Natooke he learned that even in modern life riding a bike is convenient. Liu Jun Wen is a people person and enjoyed socialising whenever given the chance. He actually even started riding a fixed gear bike. We wish him all the best for the future. This friendly and quiet Chinese girl would always be seen trying her best no matter what it was for, she also had the talent of being able to speak good English. 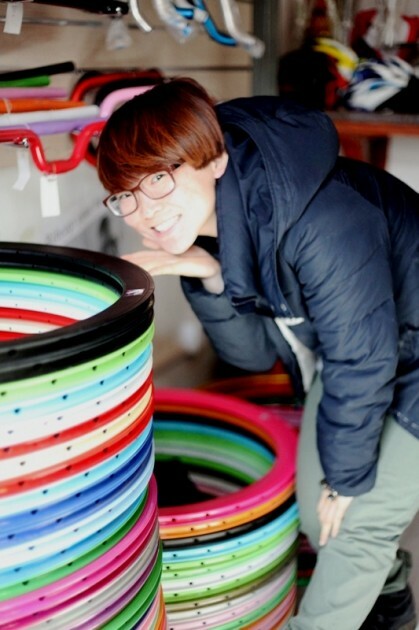 Vivian took care of purchasing all the different parts and pieces that are required for our colorful fixed gear bikes. Although overwhelmed by Beijing city, this small woman did a great job at Natooke Beijing and always did all she could to help out the team! Good luck for your future! Carol was the general assistant and inventory manager here at Natooke Beijing when we had just a few people working at Natooke. Carol became interested in bikes when she began working at Natooke, she even put together her own bike, which became known as the “watermelon”! You could recognize her with the matching Nutcase watermelon helmet riding around Beijing! Carol was liked by all, whether it was the Natooke staff, people from rides that she participated in, or even factories when making purchases from them for Natooke! Due to pressure from her family she changed to work in a pure office job. It is great to still see her at some events. Emily was a behind the scenes girl at Natooke Beijing in the times when Dupree was the only other employee. You would find her busy like a bee searching for that obscure part you wanted and ensuring that the shop was constantly well stocked with all kinds of pretty parts. But she also helped out on the shop floor if she wasn’t busy calling suppliers or “selling/renting” Dupree. A graduate in Tourism Management from Jiangxi (that should be the province right next to Jiangdong, or?) with amazing English skills, she may look harmless, but don’t be fooled! She used to commute in Beijing on a regular city bike and she came to play polo. 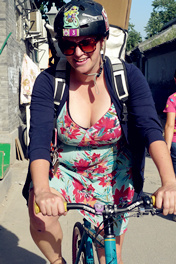 Emily is now pursuing her English Interpreter master studies in Xi’an with a brand new Natooke fixed gear bike. We would love to see you again! 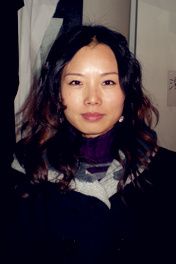 Samantha was the very first employee at Natooke Beijing. This girl from Harbin was continuously trying her best day in and day out no matter what! Samantha was always friendly and helpful. The poor girl probably had the hardest job of all: Helping Ines in the very early start up phase of the company! Her good level of English helped her a lot in this task but both her and Ines had to learn a lot in terms of what needs to be done in the process of opening a foreign company in China. 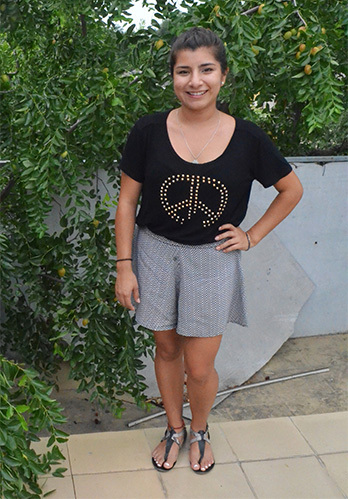 Jackie Aranda, a pint sized Californian became part of the Natooke team for a one-month internship. Jackie studied International Business at University of Nevada, Las Vegas. 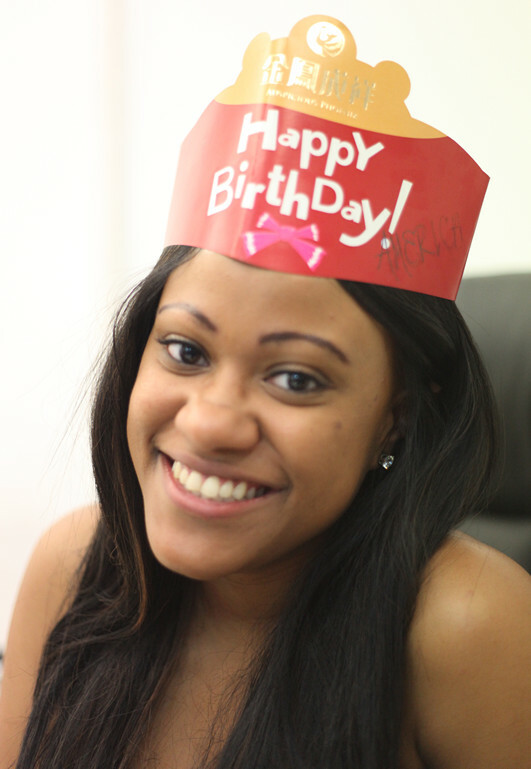 She had a bubbly personality that added to the vibe here at Natooke, constantly smiling. She will always be remembered for her work as well as her inability to master the Beijing subway system! Jack, an adventurous kangaroo flew to Beijing from Australia during rainy season. 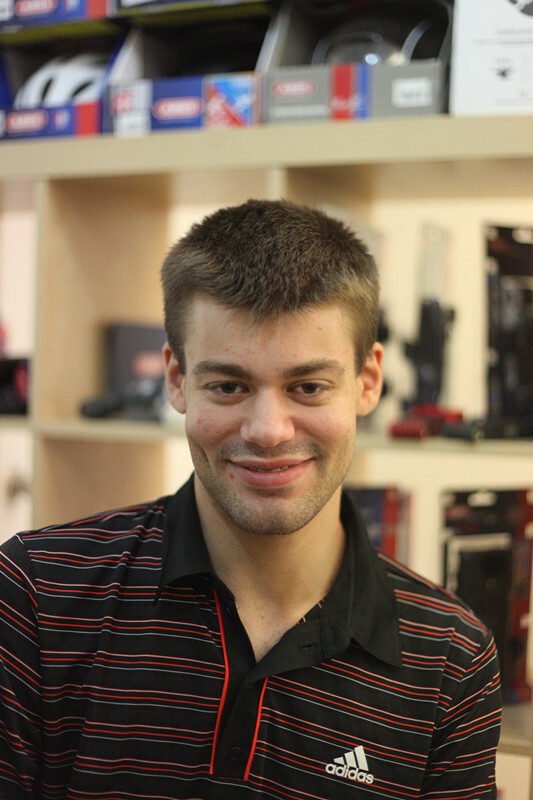 As a Marketing Intern for Natooke he worked on the company’s product catalogue. Taking pictures like a professional and being dedicated weren’t only qualities this Aussie had. He could make the team cry of laugher with his funny impersonations and jokes! After 1 month in Natooke, he will finish his Business degree and will travel the globe. We will miss Jack’s lack of chopstick skills. He will need to come back to Beijing for a bit more practice. Cheers! 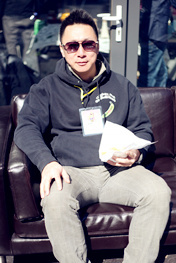 Jacky Chen was our translator and editor, where would we be without this guy (Completely lost)! He translates and edits documents for us here at Natooke for foreign brands such as Respro (UK), ABUS(Germany), Freedom (USA), Ribcap (Switzerland) and WIT Industries (Holland). He spoke fantastic English, and was super smart! Sometimes a little introverted but one of the nicest people you could come across here in China. Caution when deep thinking though, he does a lot of this! David an original Texas man now here studying Chinese has captured the hearts of Natooke with his easy going loving personality, this is one down to earth dude! He was originally the first ‘Natooke Bicycle Messenger’ because he can ride like the wind but he has now been replaced by a machine! Called the Natooke Treecycle, but he still helps out with writing awesome newsletters or comes by when we are in need of a familiar friendly Texas face. David also shares a love for bikes just like everyone here at Natooke, but to take it even one step further David is also a rocking track bike racer! An Italian-Swiss girl studying in Hawaii decided to fly to China and work with us here at Natooke. Running on swiss time with the friendly and lively Italian attitude she fit right in for the one month she was with us! Working on the Ines Bike distribution website and helping with the newsletter she really made her mark. We arn’t sure if she will ever recover from her daily commutes on her bike. Adventurous, with the ability to speak four languages she often referred to herself as “the Monster”, if you see her flying around the streets of Beijing make sure to give her a wide birth. Julian was an intern from Adelaide Australia and he was with Natooke through the cold winter. Coming from the hot summer outback to China’s freezing weather was a big change but he has settled in the Natooke family easily with his good Chinese. Julian was helping out filming and editing videos(eg.Santa costume ride, some advertising work as well as the flying banana bike frame design. He is so organised that he is able to finish all the jobs on time then hang out with friends almost every night, and be drunk. BUT he is NEVER absent from work for this reason. Although coming from Italy Eleonora Mancini was not unfamiliar with China as it was her second time in the country. Quickly assimilating herself in the lifestyle that Chinese locals have, which included her working life (her internship at Natooke), food, the nightlife and unforgettably the subways. She also showed two other interns that come in her final month, helping them adjust to the Chinese ways of getting to and from work, as well as where all the best drinking party places are. 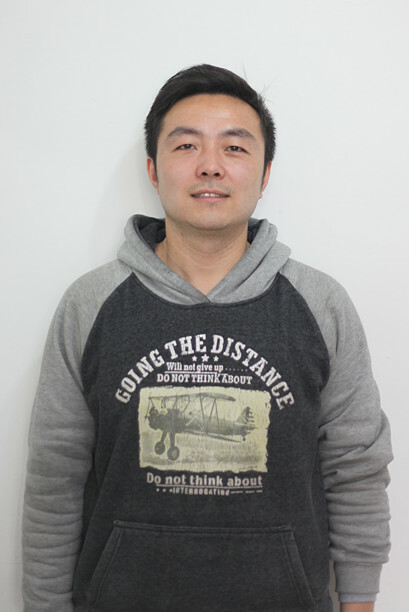 Originally born in JiangXu, China, Gary Peng has lived most of his life in Australia only to find himself back in China doing an internship and finding other employment opportunities in the area. Being able to speak the language fluently he was able to converse well with other employees and be a personal translator for some of the other interns. Being pretty much Australianised, Gary was extremely easy-going and friendly to get along with. Whilst he was only at Natooke for one month he was still able to contribute his fair share of market advertising and marketing strategies. 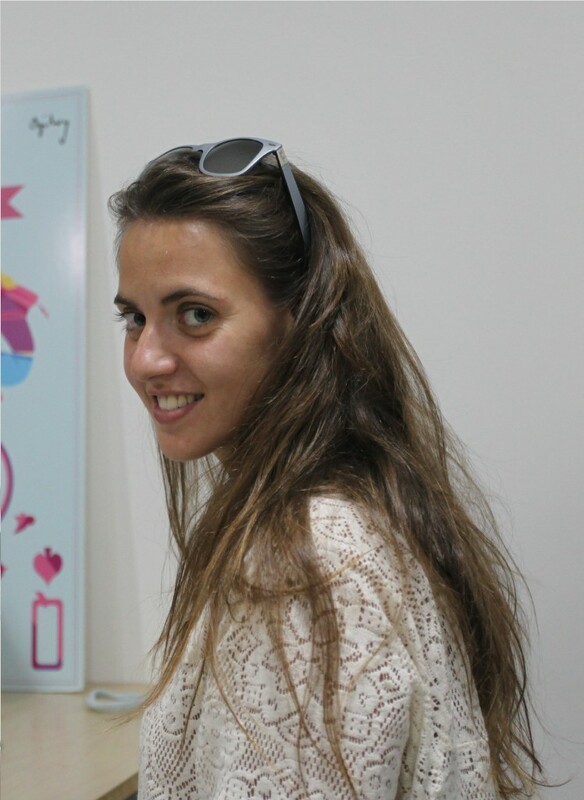 Giulia, an unceasing and inquiring Italian girl from Milan, has become a marketing intern at Natooke. She joins us for one month, diligently working on Natooke’s image and website, constantly uploading new photos and updating new contents on the website. She decided to travel to china fascinated by its culture and traditions, but especially by its increasing power in the global markets as a key player. She is graduating in two months after studying International Management at Bocconi University in Milan and she has already planned for a Master in Madrid at IE Business School with a major in sales and marketing. This friendly girl is from Cameroon where she speaks French, studies in England where she speaks English and now doing an internship in China where she is learning Chinese-Mandarin. She is working as an intern with Natooke and she is helping out with the Business management/ administration aspects of the company. Also, helping out in the workshop making the beautiful unrivaled Natooke bikes. She is passionate about languages(speaks a little bit of German), traveling and experiencing different culture, taste different food! If she is not in kitchen making tasty food then you will find her at the football pitch. If not, she is in the choir making joyful noise. Philip is here with us for a month from London keeping an eye on the marketing side of things here at Natooke. This is his first time in China, but has settled in here immediately humoring the staff with his gradually improving Chinese!! He loves his football and is an avid Crystal Palace supporter, someone has to be! When he is not watching, playing or talking about football, which is rare, he can be found listening to music from his eclectic collection. After he has completed his studies at the University of Manchester he hopes to continue to travel around the globe, including the other cities China has to offer! This half Irish half Italian charmer from London is here on a 1 month marketing internship which involves him overseeing the company’s social media operations, writing up newsletters and helping improve marketing techniques. This is Danny’s first time in China and he is absolutely loving it, his passion for traveling and adjusting to new cultures accompanied by his international Business degree, are no doubt, some of the reasons he is in love with Beijing! This extroverted American girl who comes from New Jersey is definitely a useful helper during her two-month short stay at Natooke. She loves Chinese culture so much that she had learnt Mandarin for two years before she came to China. Even though this is the first time she goes abroad, her easygoing as well as sincere personality helped her adapt to a new environment soon. Besides, she helped Natooke with some administration issues at the beginning. We really appreciate those days working with her. Cameron comes to Natooke for one month and helps with the business management aspects. His friendly and outgoing personality is shines right through his sturdy exterior. This true southern gentleman is slowly learning Chinese, and is quick to let you know how proud he is to be an American. This may be his first internship and first time traveling, but Cameron is slowly warming up to all the new experiences that await him during his time in China. 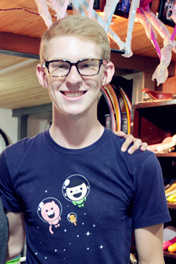 Nebraska native Eric has become the webmaster here at Natooke during his short two month stay. As the Marketing Intern, Eric works diligently updating the website making sure that everyone knows the great things that Natooke is doing. 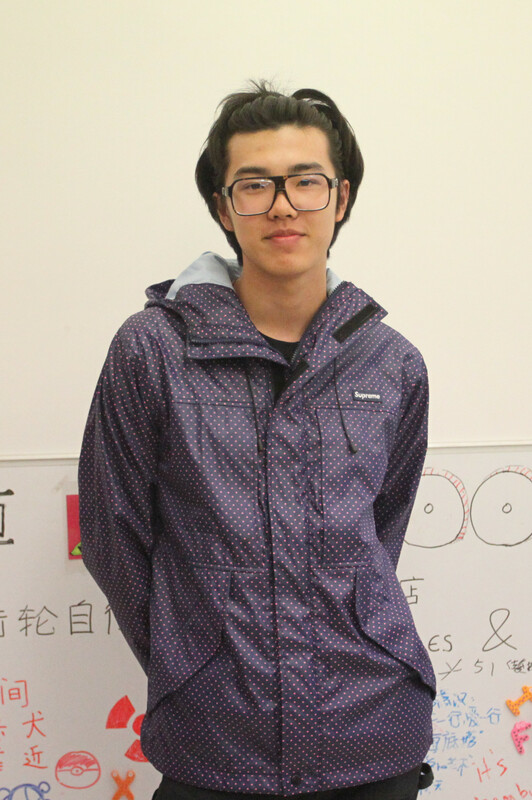 Although he’s only been studying the language for a year, Eric speaks great Chinese and is incredibly diligent in his studies. Eric’s traveled all around China, plans to return after he graduates from the University of Nebraska in order to continue studying Chinese language and culture. Charlotte is a British girl who she worked at Natooke as an intern for one month. At first, Charlotte was taken aback by the extreme difference in environment and culture between China and the UK, and found it a little difficult to adapt. Although she may have been physically uncomfortable at times, believe me this earnest girl was fantastic in terms of working. She helped us design the structure of Natooke Distribution website. Ines and all of our staff were so excited when we saw she could make a clear as well as integrated structure in such short time. She is absolutely an efficient and terrific intern for Natooke. Chloe had only been with us a short time but had gotten herself the title of ‘the beautiful one’ in the office (foremerly known as the Castle). 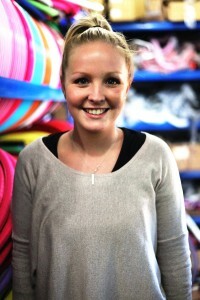 This Aussie interned with us at Natooke as a Marketing Manager for February/March and helped us out with the creation of our website. She studies in Australia doing a Bachelor of Business (Marketing & International Business), we’re sure that Chloe is still always smiling and know that she absolutely loved her internship here with the Natooke team! Deep and meaningful Duncan Douglas is known at Natooke for being structured and organized, and also a little bit cute, but don’t let him know! 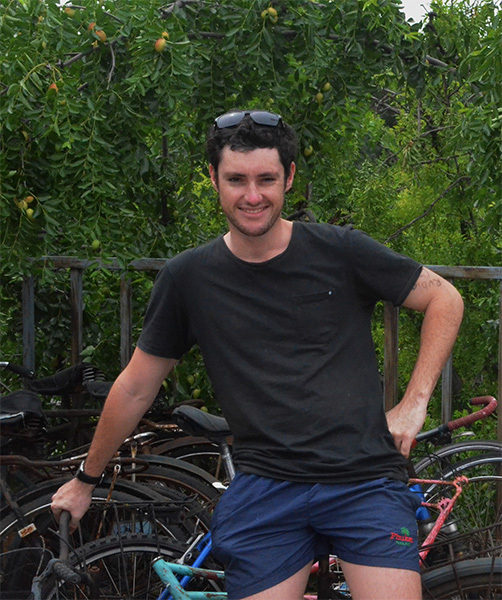 Duncan came to Natooke for an internship in marketing, and soon fell in love with riding bikes, that or he succumbed to peer pressure! Duncan worked a lot on our website as well as helping us organize the 2012 Mini Revolution bike event – maybe you have seen him on CCTV too. 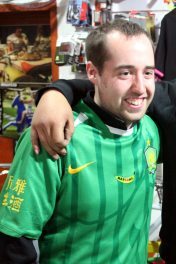 Another change Duncan the soccer fan faced in China was being soon converted into a Guo An (Beijing’s soccer team) fan, the things mysterious Beijing will do to a man! He is even considering coming back to Beijing. Good luck! 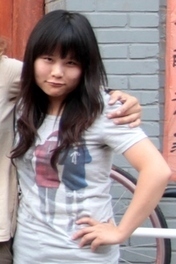 From Singapore, this very sweet girl fluent in multiple languages worked as an English teacher in Beijing. But she really likes graphic and web design in which she is a talented professional and had worked for many years in the field. 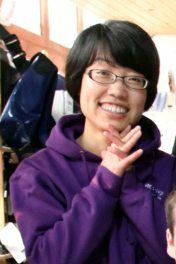 She helped us set up and design our beautiful weekly Natooke Beijing newsletters and was working on revamping our Natooke website. She also loved helping customers pick out parts and colors for their bikes because she knows what looks good. You could spot her whizzing around Beijing on her classy Flying Banana and wearing her little pink helmet! 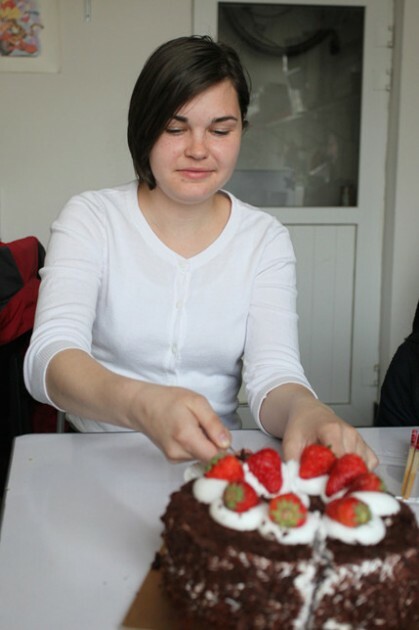 Gloria has now moved to London and we wish her the best of luck and miss her dearly! Would you like to know more about fixed gear bicycle or have something to share in this field? Then Xue is your man to come to. 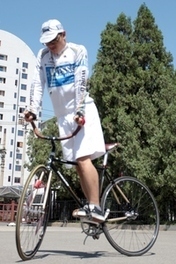 He has been riding bikes for more than 10 years and his knowledge into fixed gear bicycle is up to professional level. But be careful!! The guy always speaks slowly in a low voice, you could hardly get his idea if not listen carefully. Aha, only joking. Anyway, he treats everyone politely and he is always ready to help others. Don’t worry if you can’t speak Chinese, he could talk to you in fluent English. If you have troubles in selecting the bike, this “gold sales” is glad to spend a whole day to create a really unique one for you. 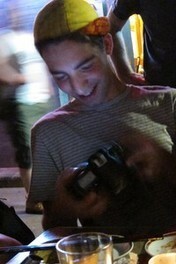 However, at the moment, he has gone to Boston (USA) for his master degree and we wish him good luck there. 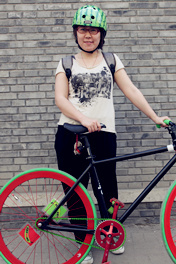 Elizabeth, Xue’s girl friend, is now a fixed-gear-bike fan under the influences of Xue. 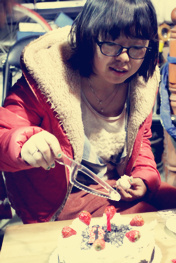 She is a forthright, generous and warmhearted girl. With superb skills in photograghy, her understanding into aesthetics and arts is original. As a volunteer of Natooke, she helped us design and draw the vivid “Flying Banana” sticker which is very popular among our customers. Though she left Natooke, we would think of her as soon as we see that sticker. 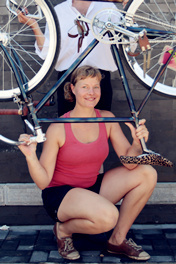 Charlotte is studying women’s bike culture on a Watsons Fellowship Scholarship. Originally from Minneapolis Minnesota, she moved and lived in Ecuador for a year. She has always loved bikes and decided to study bike culture across the globe in countries that are less developed than what she is used to. Her first stop was Beijing where she helped us at our shop, and plans to travel to Indonesia, Sierra Leone, Hungary, and finally Guatemala. This girl can do it all, from building bikes to lacing wheels, fixed or free, it doesn’t matter as long as the wheels are turning Charlotte is a happy camper. A sweetheart of a person she was great with our customers and whether they spoke English or not she always put a smile on their face. We wish you the best of luck on your trip Charlotte, and we all miss you dearly! 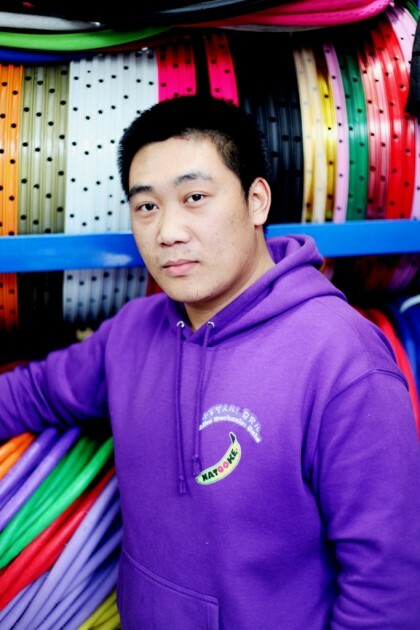 If you see a young sporty guy rocking a colourful bike, with every colour you could ever imagine, it will probably be Xiao Su riding his high end fixed gear bike! This crazy guy can’t get enough of colours, no matter if they are meant to match or not meant to match he will make them look good! 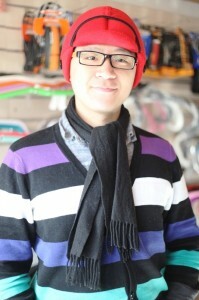 Although crazy, Xiao Su is a friendly approachable guy who loves helping out customers in our Natooke Beijing store between his terms at University. If you can’t find a tool, the chances are Will probably has it in his hands! 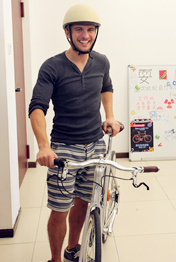 He quickly learnt how to repair and build bikes at Natooke Beijing as a part time summer job. Will is a very hands on guy and is always up for a new challenge! 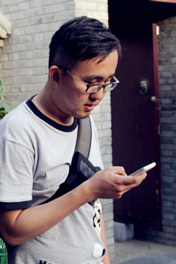 This easy going Beijing dude is very friendly and knows how to treat his customers, always with a smile! 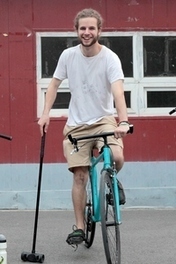 Will also loves to ride his fixed gear bike, as well as doing tricks on it! We like seeing him once in a while when he comes to say hi or comes to take part in an event. This German girl Sara came to hear about Natooke through a friend and she ended up being a very good friend and buying 2 bikes at the Beijing shop: One for riding fast and the other for doing tricks. She was really interested to learn the tricks that Ines can do and had no fear of falling whilst practicing. 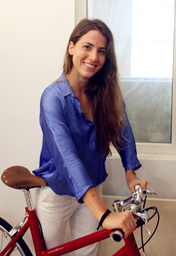 She was in Beijing for a year abroad from SOAS University London and learned more and more about bike culture. After moving back to London she came to visit Beijing in the summer and also helped at Natooke Chengdu to paint the Natooke banana on their roller door. She loved how Natooke club welcomed anybody and wants to start a Natooke group in London. We miss you! 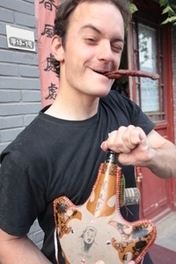 Freddy a year-abroad Swedish student from SOAS studying Chinese, is the craziest cyclist you will probably ever meet. 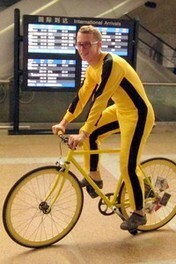 Who else turns up to the Beijing International airport with a bright yellow Bruce Lee fight suit on to match his bright yellow bike to pick up Dupree. Or who else asks a friend to ghost ride his bike 120km when she plans to go to cheer him on at the 42km long Great Wall Marathon so that he can cycle the 120km home afterwards on his fixie! 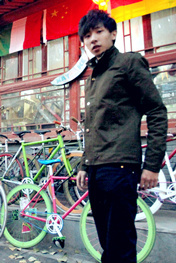 He worked part time at Natooke Beijing as a bike mechanic. He also came back for a short trip and helped paint the Natooke Chengdu shop. 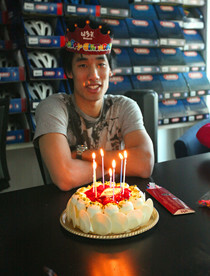 He will not be forgotten and we always think of him when Master Liu brings us his dish called “Fred’s Meat”. At 19 or 20 (he’s not sure), he was the youngest of the Natooke Beijing staff and Dupree’s little apprentice. He likes fixed-gear bikes so he “felt good in Natooke” and described working here as “relaxing”, interesting and his big boss as a “very beautiful waiguoren”. Dupree said he needed to work a bit to live up to his name, but girls: he’s well-behaved and treats his girls like he treats his bikes; with a lot of care and gentle love. You can often find Tiger doing tricks like various kinds of skids or wheelies. He often still comes to hang out at the shop or joins rides and events so it feels like he is still one of us. An English boy from Hastings who originally turned up to hang out because he lived nearby and just liked bikes, but then was working as part of our Natooke Beijing shop and polo team! He had just finished a year studying Chinese at the Nottingham Ningbo Campus before coming to Beijing and was working as an intern for Natooke helping hands-on in the workshop as well as with media/PR. He also writes for Greening The Beige, an arts collective for eco-minded people in Beijing (www.greeningthebeige.org). This talented young man likes sporty girls with tattoos. He is now in Nottingham, helping in a bike shop as a part time job and loves converting bikes. Jo was on a year abroad from Nottingham University where she studies Spanish and Chinese. English and Singaporean with a little bit of crazy mixed in, she grew up in Thailand most of her life. 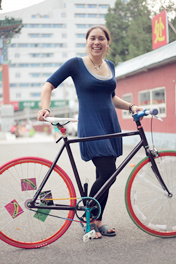 Newly introduced by Natooke Beijing to the world of fixed gear bikes and bike polo, Jo is now an avid fan! You used to find her in the shop helping work on the product list or taking pictures of our endless amount of products or find her on the polo pitch where she got her nickname “the warrior”. We last heard from her from Cuba and know she is having a hell of a great time wherever she is..
Paul was our Korean apprentice for Natooke Beijing while he was studying English in Beijing Tsinghua University. He was our right-hand man in the shop and in the office. He was in China for over 7 years so could almost be considered a China man! This charming young South Korean grew up in the suburbs of Seoul where there were lots of opportunities to get out and about on his bike. He is tall and handsome with a great fashion sense on and off his bike. 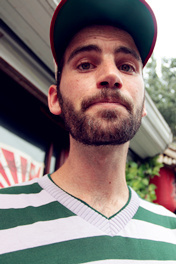 A champion bike polo player, who used to work in a Two Wheel Drive bike shop in Albuquerque. In China he would drop by our shop and work for free. He taught English in Inner Mongolia and was always coming back and forth, But he missed Natooke too much, and decided to open up a shop in Chengdu, China, with Larry! Watch out for the guy making supposedly funny comments and bearding you from behind! Brad from Boston was here right from the beginning when we first opened up the Natooke Beijing shop. 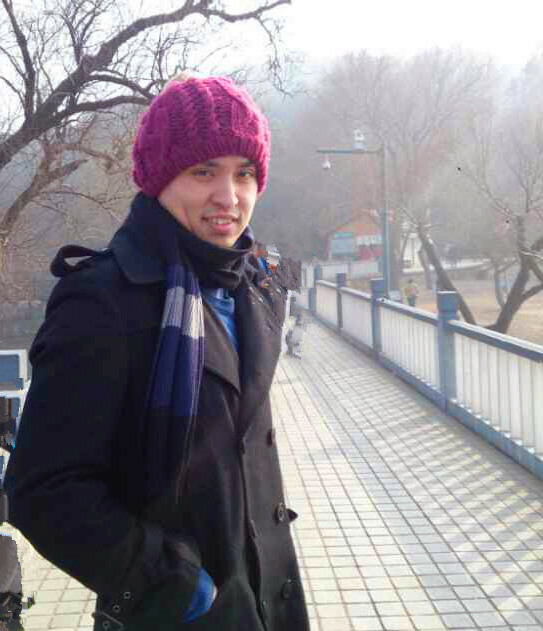 At that time he was studying abroad and after finishing his degree in computer sciences he came back to Beijing to work in IT. After a while he didn’t really like it so he came and worked in the Natooke shop instead! The first fixed gear event in China (Fixed Gear Revolution in Beijing) was actually a leaving do for Brad and James when they were leaving Beijing so we thank them for the roots of what has grown into a yearly event! Hope to see you in Beijing some time soon! 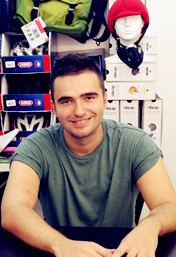 A fellow bike enthusiast from England that grew up in France with a flair for graphic design, James was here with us right from the start while he was on a year abroad in Beijing from SOAS University London. He can be attributed to the awesome design of our Natooke banana logo and to the designs on the first Beijing Fixed Gear t-shirt as well as the propaganda style Fixed Gear Revolution poster design that so many people admire. Studying Chinese and Korean in Beijing in 2009 he has left a lasting impression on all of us here! This good looking American man has muscles of steel! But don’t be mistaken by his charm he is super nice and friendly to all those he comes across, not to mention this man can speak three languages (English, Mandarin and Cantonese) and is an Architect! 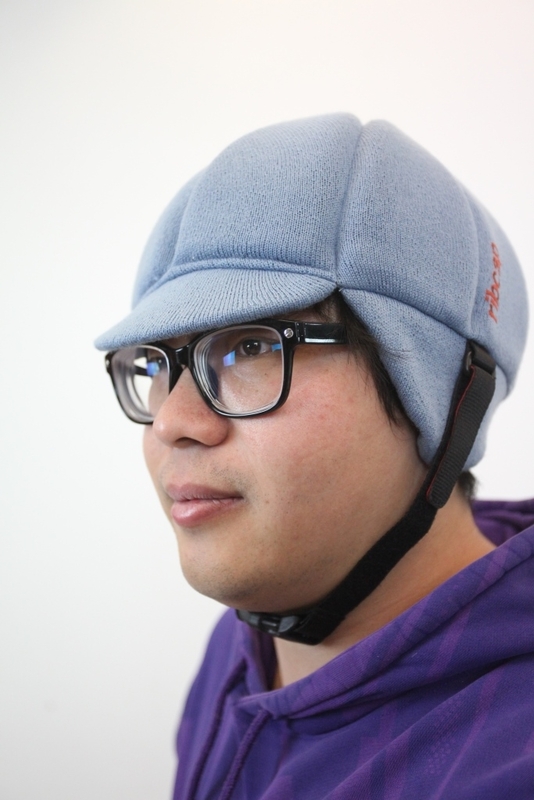 The Natooke team first met Noah because of his great love for bicycles, and for the way he can chat away with any customer that enters the Natooke shop doors. Ask Noah about his adorable German Sheppard Dog!